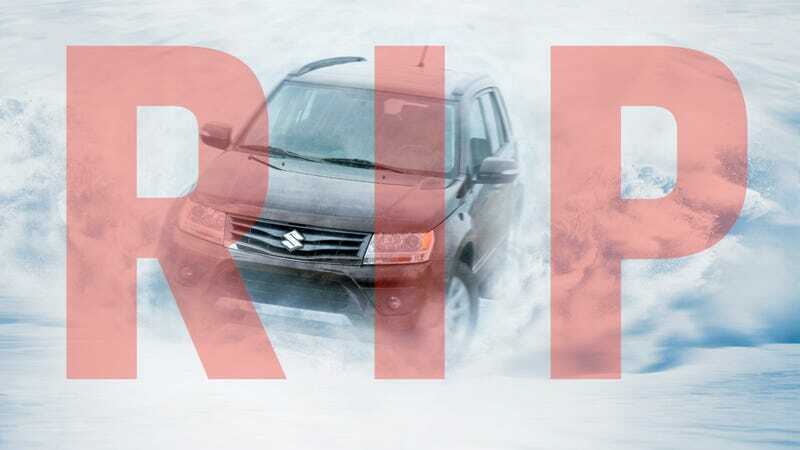 Today, with a heavy heart, we remember Suzuki, the "little Japanese car maker that could" which actually couldn't and finally ended its own life, Kevorkian-style, at the tender age of 27 [1985-2012]. American Suzuki Files For Bankruptcy, Will Stop Selling Cars In The U.S.
Over the past few years, Suzuki has been a very small fish in a very large but shrinking pond, fighting for scraps but always losing out to even its most disadvantaged adversaries. When future product looked to have promise, Suzuki continually rolled snake eyes on timing, packaging, and marketing for its range of all-imported vehicles (save the Equator, made by Nissan). Instead of letting automotive Darwinism take its course, Suzuki decided to perform euthanasia, just 24 hours before a presidential election (great timing to bury those bankruptcy headlines! ), in order to save its powersports brothers and sisters. After agreeing to a partnership with General Motors in 1981, Suzuki began its life in America selling the rebadged Suzuki Cultus as Chevrolet Sprints in 1985. It was the first in a long line of captive imports that would be brought to the US and Canada by General Motors, creating short-lived brands like Geo, Passport, and Asüna, with Saturn later filling the void. Using its same connections at GM, Suzuki also brought in a vehicle under its own name that would transform the market for years: the SJ-413, what we would affectionately call the Samurai. While successful in other markets around the world, the diminutive off-roader was a knock out hit in the US, with 47,000 Samurais finding homes in driveways all over the continental United States. But, as luck (or lack thereof) would have it, a Consumer Reports article spelled doom for the little SUV when it said the Samurai was prone to rollover, resulting in a lawsuit years later. Also during this time, Suzuki and GM shacked up together in Ingersoll, Ontario at the new CAMI Automotive. The factory, run similarly to that of NUMMI in California, continues to produce vehicles to this day. However, Suzuki left the joint venture when it discontinued local production of the XL7 SUV in May 2009. After multiple reports of Samurais tipping at highway speeds, Suzuki reorganized and continued to produce well made products with a cult-like following. Leveraging its relationship with General Motors, the Suzuki Sidekick and second generation Cultus (Swift) enjoyed steady sales in markets around the globe under a number of different brands. Who didn't love the powerful little Swift GTi? To this day you can still purchase a new Suzuki Sidekick (badged as a Chevrolet) in certain South American markets. They became well-respected amongst the off-road crowd while also popular with young, active families and those looking for economical, tough transportation. It wasn't all rainbows and unicorns for the Japanese automaker, as the X-90 cute ‘ute and Esteem compact would fall on mostly deaf ears in the US. General Motors would eventually gain more influence over the Japanese automaker. And, in 2002, GM would force Suzuki's hand into taking a 1/3rd stake in Daewoo in Korea, which would eventually be called GM Korea. An unfortunate result of this joint venture was the introduction of the Suzuki Forenza/Reno, Verona, and Swift+ (an Aveo clone in Canada) to the North American market. These cars, with their horrible performance, poor reliability, and staid styling were the equivalent of covering Suzuki dealer lots in plaid, button-up, long sleeve shirts. After the Forenza and Verona went through a generational cycle, they were killed in favor of the Suzuki SX-4, the result of a partnership between Suzuki and Fiat (which sells the same model as the Fiat Sedici). During these years, Suzuki would slowly distance itself from big brother General Motors in search for better opportunities elsewhere. Once General Motors and Suzuki said the majority of their goodbyes, the Japanese car maker was hungry for tie ups. Their long-standing partnership with Maruti in India has placed the stylized S at the top of Indian automotive sales charts for years where it enjoys double digit market share. However, to grow in markets outside of its native Japan and wildly successful India, some handshaking needed to be done. A partnership of sorts between Suzuki and Volkswagen was initiated where the Dub would have access to Suzuki's small car platforms while the Zuk could leverage VW's powerplants for future models. However, after over a year of collaboration between engineers of both companies, current president of Suzuki, Osamu Suzuki, threw a hissy fit and said he had enough of the German influence. All the engineers shrugged their shoulders and went their separate ways. American Suzuki Motor Corporation's only domestically developed model, the Equator, was an answer to a question that was never asked: the Suzuki pickup truck. Based on the Nissan Frontier in almost every way, the only real differences being branding, a grill, and some forward sheet metal, the Equator didn't enjoy nearly the number of sales as its Nissan sibling. It only sold for one year in Canada before getting the boot, and in America it has received little to no attention in the update department since being introduced in 2009. Suzuki's savior, the Kizashi, arrived to critical acclaim from most automotive journalists. But, due to a serious lack of dealer network, no national marketing campaign, and limited packaging, the Kizashi never made a dent in mid-size vehicle sales, continually coming up close to last in the charts. While the automotive business has been declared dead, Suzuki will still continue to sell motorcycles, ATVs, and Marine products in the United States. And, if you are really hungry for a Suzuki on-road vehicle, Suzuki Canada will continue to operate in the Great White North Commonwealth of Maple Syrup and Bacon. Mark Stevenson is a Canadian autojournalist with a peculiar interest in Suzukis, you can follow him over at shiftanddrive.com.